Florida has the largest number of snowbirds each winter – and not only from Canada but from the U.S. as well. Its proximity by car to Eastern Canada and the Northeastern and Central U.S. has made it a natural place to head to in the winter months. It has a mild, sub- tropical climate and long stretches of coastline, inland waterways and lakes. Most snowbirds head for either the Gulf Coast along the Gulf of Mexico or the East Coast on the Atlantic side. But there also are plenty who head to the centre of the state, the panhandle further north and the keys in the south. Canadian snowbirds flock to condos, homes, RV sites, mobile home communities and even sailboats for the winter. Amenities: Due in part to the large number of Canadians and Americans who permanently retire to Florida or spend their winters there, you’ll find excellent facilities for boomers and seniors everywhere, including medical, recreational and cultural. Flying there: The West Coast is well served with non-stop flights from Eastern Canada into Tampa, St. Pete’s/Clearwater, Sarasota/Bradenton and Ft. Myers airports. The area is also a short drive from Orlando airport. All areas are reporting an increase in Canadian arrivals over the past few years, which makes sense as more and more Baby Boomers are retiring and their friends and families are coming to visit them. A huge favourite with Canadian snowbirds is the area around Ft. Myers and Sanibel Island. For the past several years, The Beaches of Fort Myers & Sanibel has experience substantial growth in Canadian visits with the past two years showing 11.5% and 6.7% growth each winter. Southwest Florida International Airport (RSW) in Fort Myers has non-stop seasonal flights from Toronto, Montreal and Ottawa. The area offers 50 miles of white-sand beaches holding as many as 400 varieties of shells, and is renowned as one of the best shell collecting locations in the world. There are variety of nature and wildlife preserves and refuges. The J.N. “Ding” Darling National Wildlife Refuge on Sanibel Island ranks among the most-visited wildlife refuges in the U.S. The Beaches of Fort Myers & Sanibel is also home to one of the world’s largest populations of Atlantic Bottlenose dolphin. A variety of water sports are available to keep you busy throughout the winter, including boating, kayaking and world-class fishing. On the cultural side, the Edison & Ford Winter Estates in Fort Myers is among the most-visited historic homes in the U.S. - an 1886, 14-acre riverfront estate, laboratory, and experimental gardens. The three-acre winter home of Henry Ford features a display of Ford vehicles dating back to 1914. Naples is at the southern end of Florida’s West Coast and has the same white powder sand beaches that the entire coast offers as well as a barrier island, Marco Island, which is linked by bridges to the south end of Naples. Considered by many to be an upscale destination, the area attracts many snowbirds due to its warm weather (it is across from Ft. Lauderdale and Miami) gorgeous beaches, many golf courses and high end shopping and dining. The area is close to the Everglades and offers many tours visitors can take to explore this unique Florida park. Visitors to Naples flock to the Historic Naples Pier and trendy Fifth Avenue South in the downtown area and Bayfront, with its fabulous shops, galleries and restaurants. As a large city, Tampa has much to offer its long term winter visitors. It is home to an international airport and also is a cruise port. Tampa also features fabulous shopping, dining and entertainment at the International Plaza and Bay Street. And just south of Tampa, there’s the Ellenton Outlet Mall. Hockey fans can see the Tampa Bay Lightning play visiting NHL teams at Amalie Arena downtown. The Straz Center for the Performing Arts hosts the Florida Orchestra, Opera Tampa, local theatre companies and a Broadway season each winter. Ybor City, the historic Latin quarter, comes alive at night and also features Saturday markets and cigar rolling. The popularity of little Dunedin has exploded since the Toronto Blue Jays made it their winter home. Snowbird baseball fans can watch their team train and play in spring training. 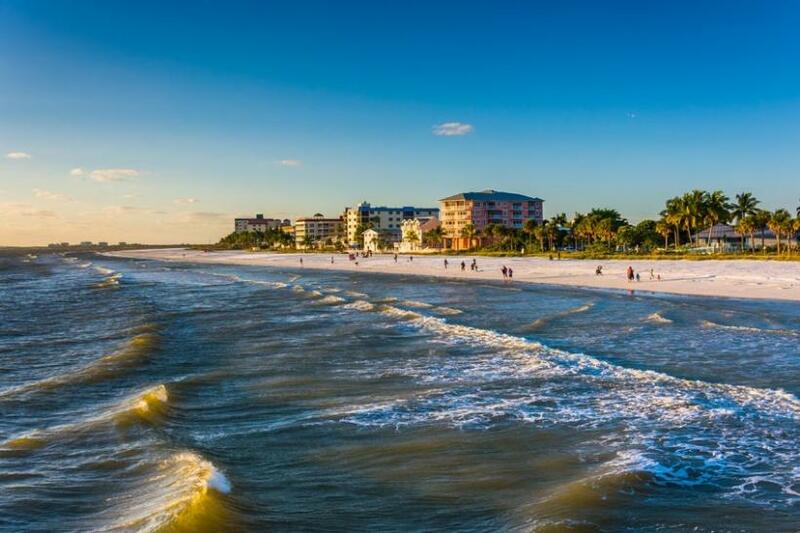 Just across the causeway from Tampa Airport lies Clearwater, a 3-mile barrier island known for its white sand beaches, family friendly resorts, condos and restaurants. Many Canadian snowbirds make Clearwater their winter home. Attractions include the Clearwater Marine Aquarium, the historic Capitol Theatre and Ruth Eckerd Hall for concerts, from classical to pop and dance. Baseball fans can catch spring training games at Bright House Field, where the Philadelphia Phillies conduct their spring training. Universally known as “St. Pete’s”, it is joined at the hip with Clearwater both physically and in everyone’s mind. Founded in the late 19th century, St. Pete’s growth was aided by the railroad coming to town and later during the war years, U.S. military bases. Tourism flourished and still does today. St. Pete’s has the same white powder sand beaches as its neighbour Clearwater and is home to many snowbirds each winter. Major attractions include the Dali Museum and the Dale Chihuly glass collection, as well as several art districts that make up St. Pete’s rich art scene. There are lots of funky restaurants and festivals going on in the winter and wonderful views from the nearby Pass-a-Grille historic district. Sarasota shares an airport with nearby Bradenton and both are home to many Canadian snowbirds. The airport is attracting more flights from Canada each year which explains the rapid growth in Canadians visiting the area – Sarasota reporting a 22% increase in 2015. Sarasota is a beautiful city built around Sarasota Bay and has gorgeous quartz sand beaches along its barrier islands of Anna Maria, Longboat Key, Lido Key and Siesta Key. Beautiful, crescent shaped Siesta Key beach was named the #1 beach in North America by several sources in the past few years. Snowbirds love Sarasota for its extensive arts offerings including a symphony orchestra, an opera company, and a vast array of performers at the Van Wezel Performing Arts Hall. The vibrant downtown has many excellent restaurants and boutiques. Baseball lovers can catch spring training in Sarasota, home to the Baltimore Orioles and in Bradenton, home to Pittsburgh Pirates. There are dozens of golf courses in the area. The area south of Sarasota has a number of great options for snowbirds, starting with Venice and Englewood Beach and the lovely Boca Grande. The main north south interstate I-75 moves inland to get around the expansive Charlotte Harbour passing both Port Charlotte and Punta Gorda. Port Charlotte has been a favourite with Canadian snowbirds for many years. Located about half way between Sarasota and Ft. Myers, it has miles and miles of natural waterways which are great for fishing and kayaking. Home to the Tampa Bay Rays for spring training, the wonderful Myakka State Park is nearby. Punta Gorda lies on the south side of the bay, and has a beautifully restored historic district as well as waterside dining and shopping along the Harborwalk and at Fisherman’s Village. A boater’s paradise, the area is popular with motor boat and sail boat lovers.